Crafts Style - Red Brown Oil Spot Sheaf Mouth Vitrified Surface ; the Chinese FengShui of five elements (metal,wood, water, fire, earth) theory of faith that is a system of laws considered to govern spatial arrangement and orientation in relation to the flow of energy - 5 Elements is FIRE attribute. 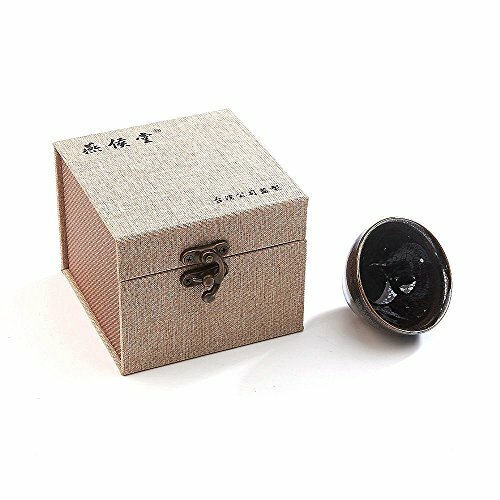 Crafts Style - Oil Spot Sheaf Mouth Vitrified Surface ; Though the pattern of all cups are similar, they are not exactly the same ; The color maybe will be a little deeper or lighter to each one.SO EVERY JIANZHAN TEA CUP IS UNIQUE AND SPECIAL, ONE OF A KIND! Collectable & Valuable - JianZhan is handicraft artware, the longer you keep it, the more precious it will be. Certificate with Yan Hou Tang & Designer signature.More infomation about Chinese culture just follow \" Yan Hou Tang \"
Wife loved it. That is a win in my book.